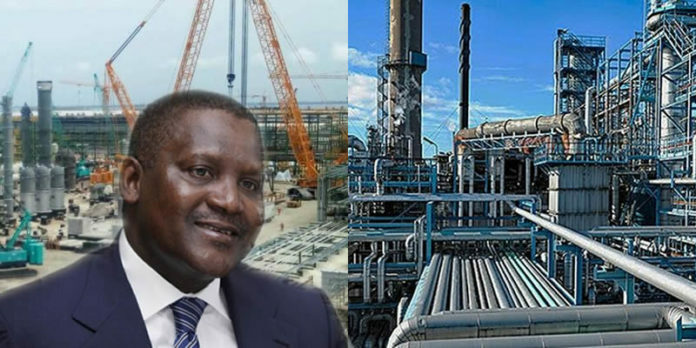 The Dangote Petroleum Refinery will produce 65.4 million litres of petrol , diesel, aviation jet fuel, and kerosene daily, when it becomes operational, Devakumar Edwin, the company’s Group Executive Director, Strategy, Capital Projects & Portfolio Development has said. He noted that the high volume of petroleum products will transform Nigeria from a petrol import-dependent country to an exporter of refined petroleum products. According to him, the refinery is being designed to accommodate multiple grades of domestic and foreign crude and process these into high-quality gasoline, diesel, kerosene, and aviation fuels that meet Euro V emissions’ specifications, plus polypropylene. “The project will provide thousands of direct and indirect jobs and add value to Nigeria’s economic development. It will lead to significant skills transfer and technology acquisition opportunities in the country”, he said. He disclosed that the company is also constructing the largest fertiliser plant in West Africa with capacity to produce 3.0 Million Tonnes of Urea per year. The Dangote Fertiliser complex consists of Ammonia and Urea plants with associated facilities and infrastructure. “Dangote fertiliser project is planned to possess unique features like having the largest granulated Urea fertiliser complex under development in the global fertiliser industry, with an investment of $2.0 billion and a capacity of 3 million tonnes per annum, covering some 500 hectares of land”, he added. Edwin said Dangote Fertiliser will guarantee substantial saving of foreign exchange in Africa and create surplus Urea for farmers to enhance production of food grains and vegetables. He noted that the Fertiliser plant’s core indication include a massive employment generation, which will effect a reduction of transmigration of people from rural to urban centres. Edwin disclosed that the company has launched a youth empowerment and capacity building programme in the communities around the Dangote Refinery. He added that the programme is geared towards adding value to the lives of the youths and their communities and equip young men with trade skills that would prepare them for better opportunities. “At Dangote Industries Limited, our corporate social responsibility projects are centred around the development and well-being of the people, especially our host communities. In Ibeju Lekki, we have executed several projects that are enhancing the lives of the people. We have provided boreholes for all the communities, classrooms for the local schools, and we just awarded scholarships to 51 secondary school students”, he said.